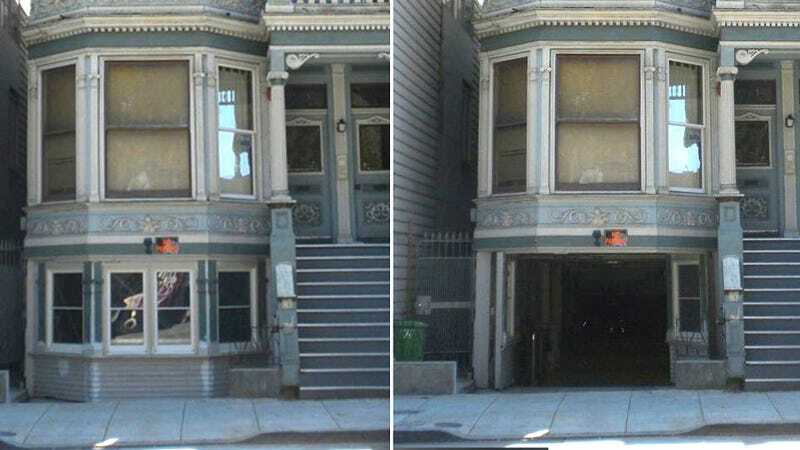 San Francisco's strict historic ordinances means its entirely legal to build a garage in the ground floor of your Haight-Ashbury Victorian apartment house, but there's no way they'll let you replace the beautiful three-sided bay window with a garage door. So how do you get it in? A little architectural magic. The owner of the property on Oak Street just happens to be a mechanical engineer and envisioned a bay window that would collapse in on itself to create a garage opening. The city approved the idea so long as he kept the details in place and kept the original wood and glass intact as much as possible. Beausoleil carefully measured the elements of the existing façade and drew them up, then determined how the bay window sides could be split apart from the rest of the building with almost invisible seams. They envisioned a steel framework that would be secured to the back of the walls before they were cut away from the structure – allowing the fabric of the building to remain virtually intact, studs, siding, windows all moving in concert. The front yard, which had a possibly original wrought iron fence, also had to be redesigned to incorporate a driveway and a percentage of planting areas in accordance with the zoning code. Beausoleil prepared a supplementary set of construction drawings to complement the structural set previously approved. To make the doors work mechanically, there are two floor mounted hydraulic activators, which rotate the doors on pivot hinges. Further details, including control and security hardware, were worked out in the field by the installer, Rick Dentoni of Automatic Gate Installations. The garage is now capable of holding four cars and only eliminated about 10-feet of parking space in front of the building.